This is my latest entry in my journal, again I have had a lovely time playing with pattern. I am surprised about my patience in the repetitive pattern making, but I have realised that I find it very meditative and calming. I also am very run down at the moment and the chronic fatigue is turning my brain to a pea soup fog, so the gentle repetition is very soothing. 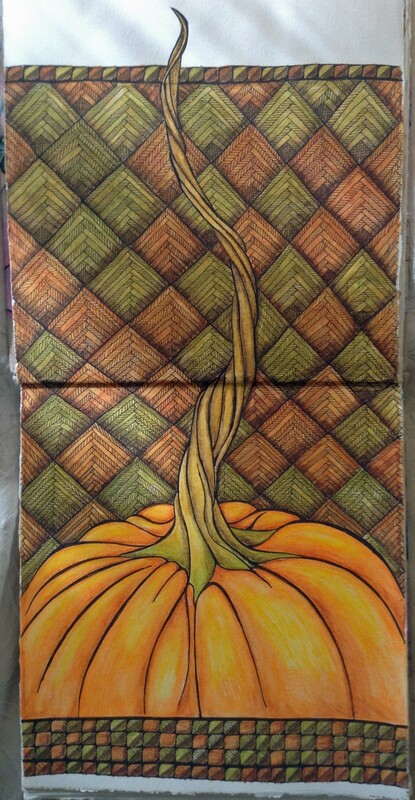 Pumpkin, journal page. Watercolour pencils and ink. Not to worry as I have finally got my holiday and I have three, wonderful, fantastic and much-anticipated weeks off, where I can just relax and make all kinds of art. How fabulous is that, I can’t think of the last time I had three weeks just to chill out. You will be getting a lot of posts from me during this time as I share all the things I will be doing. 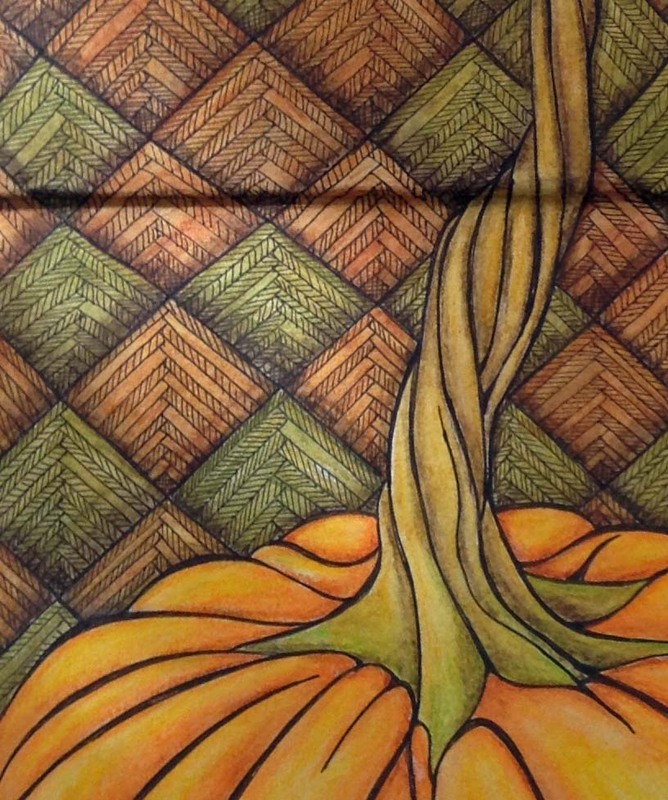 I saw this great picture of a pumpkin with this wild twisty stem and just had to draw it and then matched it to this fabulous pattern, I love the autumn colours and the country feel to this picture. I found them all on Pinterest where I am collecting the best array of pictures and pins. See me there under Karen Bailey. This entry was posted in 2014 Artwork, Journal, What inspires me and tagged art, autumn, color, colored pencil, colour, coloured pencil, coloured pencils, drawing, flowers, journal, painting, pattern, patterns, pumpkin, seasons, watercolour, watercolour pencils, zentangles. Bookmark the permalink. This is gorgeous Karen! The colours you have chosen are so warm and autumnal, just right with the pumpkin. I can understand how much you enjoyed the repetition of creating the background, I enjoy that sort of thing too! Enjoy your holiday, hope you will feel quite restored by the end of it. Thanks Anna, already relaxing and making art. I know what you mean about the meditative nature of rendering repetition. It is quite comforting isn’t it. The ordered pattern behind contrasts with the wild pumpkin…maybe a metaphor for the different extremes of our human nature. This is beautiful! I love everything about it.